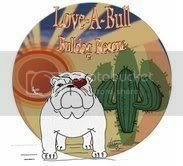 To view the Original Story Published On Love-A-Bull Rescue's website, Click Here. I got a phone call from a local breeder here in Phoenix. The only words that I remember are: "20ish dogs, can you get them tomorrow? I am losing my house"... Being a rescuer I kept thinking, "Am I enabling her by taking these dogs she has bred to death?"... At that point, I just visualized 20 bullys that needed me. Keith, Michele, Kelly and I showed up at this lady's puppy mill. Behind 2 sets of coded gates was a house with trailers all over the property. I knew what was in those trailers. The "breeder" and her 2 adult children were there, along with a "worker" who whelps litters. Being in "survival mode", we made a list of all of the dogs, and had them bring each one out one by one so we can get them microchipped and give them a collar. There were flies swarming the property and feces everywhere. Not to mention it was 108 degrees that day. Each dog came out running fast, basically slithering on the ground like a snake, not knowing what may happen to them. There were a few that can't even walk. Puncture wounds on almost every one of them, missing eyes, skin issues, ticks, mange you name it. That is what was visible in the minute we got to spend with each one. Most of them hit the ground when you walk up to them, and urinate on themselves. Each female had c-section scars, and appeared to have just had a litter. One of the females they brought out was due to give birth any day. She was laughing to us saying how she breeds each female to 3 different males, and AKC has been to her home. She said they swabbed for DNA and the DNA didn't match... All she had to do was pay a fine and notify the puppy buyers. She laughed when she said "I just told them AKC made a mistake and their dogs can't be registered." She found this very funny. 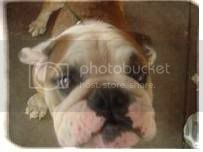 She also told us many "bulldoggers" who have bred to her, and some who even co-breed with her still. We got surrender forms on each one with no issue, and got outta there. We were to make another trip that evening because 4 of the dogs on the list were left behind since we didn't have enough car space. We got everyone dispersed between the 4 of us, and headed home to bathe and groom. At this point, I think we were all still in a state of shock, and the emotional trauma of this hasn't hit. A volunteer went back that evening to get the remaining 4. No answer on the door, so she banged on windows and walked around back... She opened one of the gates, and opened the first trailer door. There were over 30 bulldogs staring back at her. 2 foot by 2 foot runs, made of cinder block, with built in puppy pens above each run for the puppies. Cameras were everywhere, she panicked and left. Animal Care and Control and the Sheriff's office were notified. They came to her home, and called me when they left. Every dog was in feces and urine, covered in ticks, BUT ALL HAD ACCESS TO A WATER DISH, and there was a open bag of food on the ground. NOTHING THEY CAN DO. The officer called me and my heart sank, knowing that I will never get those 4 dogs. They got the raw end of the deal. I thought I was doing the right thing by notifying the Sheriff's office, but that just backfired. We all like to think that Animal Control, Humane Society, AKC and the police can stop these people. WRONG. AKC gets the registration money for each dog. That's all they are: a registration company. Why does AKC continue to register puppy mill/pet store dogs? $$$$$$$$$$$$ Just because your dog has AKC papers does not mean he/she came from a happy place! Pet store puppies are usually bought from breeders just like this one! A puppy being shipped out of state, could be coming from a place like this! Those poor 4 dogs that just happened to be at the bottom of that list. I lay down at night and that damn list just keeps popping in my head with those dog's names, Lulu, Scarlett, Bailey and Roxy. Not to mention the remaining 30 plus. Let's Meet the Lucky 12 Who Were Rescued Below! Meet Sammy~ 2 Year Old female. Awaiting her spay, entropian and possible thyroid test. Oreo lives in Northern California, she was transported up there needing knee surgery- and now has a forever home! 2 Years old, Multiple breedings and never took... When she walks into a room, it's almost like she says "WOOOOOOO WOOOOOO, get outta my way...WHHHHEEEEE!!!!" Nervous energy to burn, scared out of her mind. 3 Year old male. Has sired MANY litters at her kennel. Very friendly, very sweet! LOVES the water, so a kiddie pool for him is a MUST in his new home! :-) HATES other dogs. 3 Year old male. Had a tumor removed on his side in MAY, AND STILL HAD STITCHES IN HIM in September! They are obviously infected, and the stitches are popping open. It's about a 4 inch section on his side. 5 Year old female. Produced 5 litters for her breeder, then she got pyometria. She was spayed August 4th, and STILL had her stitches in! They were embedded in her skin! Severe dry eye, ticks and ear infection. Snooozz lives in New Mexico with her mommy and is spoiled every single day! 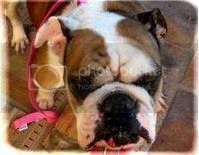 Petunia-renamed "Duckie"... when she arrived in rescue she could not walk well. She slithered like a snake on the ground urinating everywhere. She needed work. Lots of work. Unfortunately, Petunia had a severe case of spina bifida and was humanely euthanized. She was in rescue for a year- and had numerous severe bladder infections that hurt her and wouldn't go away. It was very sad. There you have it. The next time you purchase a puppy over the internet and do not go to the facility where your puppy has been bread, you could be buying from someone just like this breeder. She sold over $300,000 worth of puppies over the internet, and luckily seems to have become quiet.... let's hope she gave up breeding for good! Remember: A little love and compassion can mean the WORLD to an animal in need. 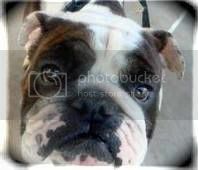 AKC Bulldogs ARE in our shelters and puppy mills every single day! We don't do this for glory, we don't do this for praise. We do this because we ALWAYS root for the recovery of the underdog. ALWAYS HAVE AND ALWAYS WILL! This is one of the stories that really upset me- especially since I knew this so called 'breeder'. Sneaky and slimy like a slithering snake.... to know what a breeder is capable of.... it is just disgusting! Finding out the truth was so eye opening..... but it also made me more aware that people and breeders who are trying to make money will do anything to the dogs- because they are not their pets, they are just machines to them.... I wish I could do to her what she did to these poor dogs! The cruelty of some humans shocks me all the time. I can comprehend how they are capable of doing such inhumane and awfull acts. these are people that live among us,parents,husbands,wifes.... its as if there's no good in their hearts, no love, no compassion and no regard for life at all. 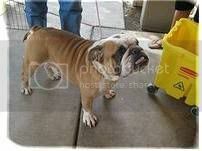 I agree with you Desertskybulldogs, I would like to do to them the same they did to these poor dogs. Sick sick sick. She will have to answer to a mightier person in the end! We are all Gods creatures. In the mean time, Karma will take over.